We're spotlighting some of our BBC employees from around the country– including military veterans and spouses– in recognition of NAA's RPM Careers Month! 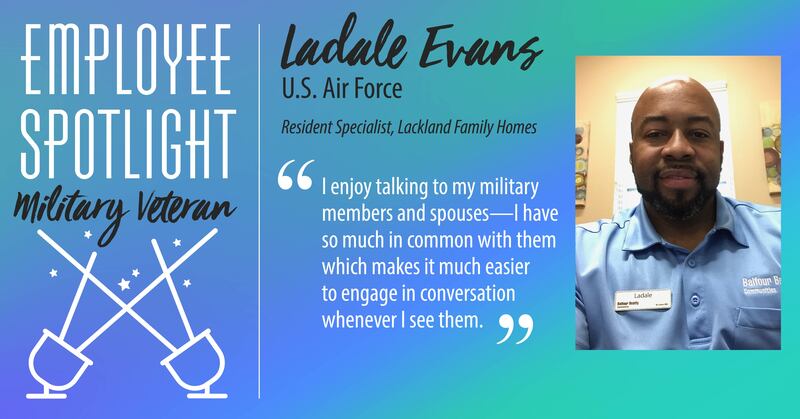 Continue reading to learn more about Ladale Evans, resident specialist. How many years did you serve in the military? I completed 22 years in the U.S. Air Force. What made you decide to continue your career in the military field after your time as an active duty service member? I chose this area for work because it’s a military city, the good schools for my children and the colleges for my spouse, the multiple VA hospitals, and the diversity of the city. How long have you worked for BBC? Almost 3 years. What do you enjoy most about your job and working with military families? I enjoy talking to my military members and spouses. I have so much in common with my customers, which makes it much easier to engage in conversation. I also enjoy the expressions from military members when they receive a home—it’s a great joy knowing I have provided a home to military families.